Did long-suffering insomniac Erika commute to work, converse with her boss, and subsequently return home and go back to bed -- all while fast asleep -- after trying Ambien for the first time? During one his many sleepwalking episodes, did Keith destroy an expensive lamp in a vain attempt to rescue his mother who was inexplicably trapped inside the walls of his bedroom -- or so he was dreaming at the time? After suffering a freak accident during a class trip to an amusement park, was high-school student Skylar abandoned by her fellow classmates and teachers in the Intensive Care Unit of a Richmond, Virginia area hospital so that they could continue the trip without her? Did University of Virginia computer science student Chelsea get fired three weeks into her internship at a New York City-based finance startup after her bosses discovered that she didn't know how to use Microsoft Excel? By the time the final story came to a close, the scene was abuzz with energetic chatter. 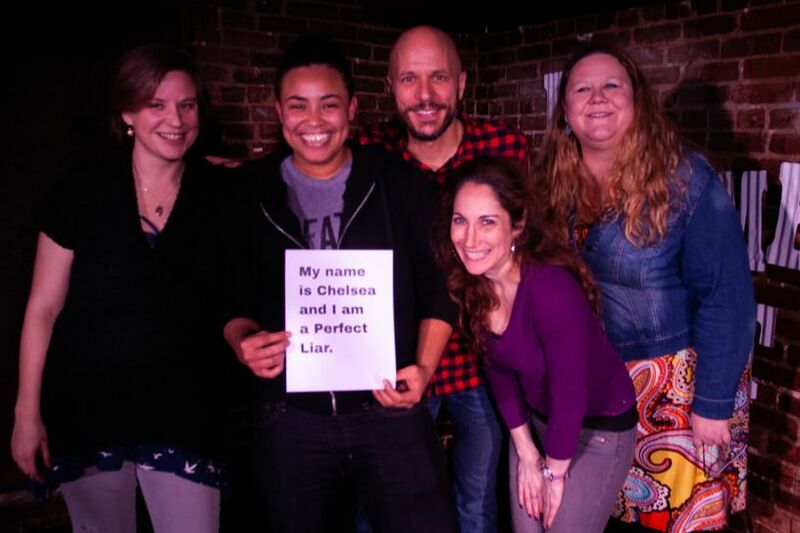 Audience members, many of whom had been duped at past shows, were confident that they had spotted the night's liar. Would those convictions survive the interrogation round? Would the final reveal validate those instincts? Rest assured, this evening was far from over. If Erika was unable to operate heavy machinery under the influence of Ambien, how did she get to work that mysterious morning? Was Keith's mother aware of his proclivity for sleepwalking and, if so, why would she decorate his bedroom with expensive adornments? Could Skylar elaborate on the dental surgery she needed to repair the broken teeth she suffered in her horrible fall? How was it possible that Chelsea, a computer science major and a Java developer, couldn't understand Excel? 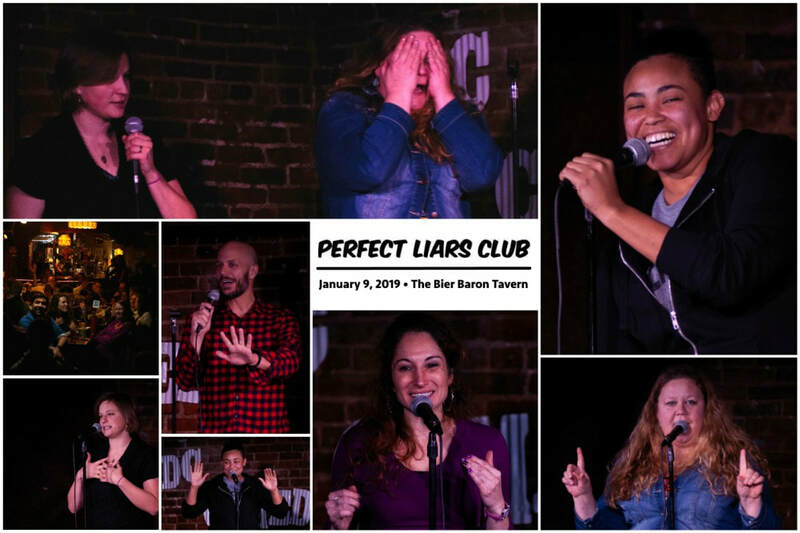 As is so often the case at Perfect Liars Club, time ran out before the audience ran out of questions. It is entirely possible, however, that our inquisitive interrogators were more interested in badgering the storytellers than uncovering the truth. Hands were raised. Votes were counted. And, remarkably, our top vote-getters nearly found themselves in a three-way tie for most suspicious. Erika led the way with 29 votes, followed by Chelsea with 25 votes and Keith with 24 votes. Skylar, deemed the most trustworthy of the bunch, amassed a mere15 votes. The drum roll sounded. The storytellers jockeyed for position, feigning guilt (or innocence) for the delirious crowd. The delighted squeals of the audience reached an ear-piercing magnitude, climaxing in validated shouts of confirmation for exactly one-quarter of the room, as the remainder groaned sighs of disappointment. Chelsea stood before them all. Another Perfect Liar unspotted. It wasn't a dream. DC's best and brightest had been fooled again. And, despite the result, it was absolutely magical.